machine, what will happen when the policy is applied? A. It will fail with an alert. Primary level of failures to tolerate=3 is not supported with mirroring. B. It will fail with an alert. The policy of a running VM cannot be dynamically changed. number of fault domains and available capacity. D. vSAN will switch its failure to tolerate method for any VMs with that policy, to optimize for space. Primary level of failures to tolerate=3 can only be accomplished with erasure coding. For a hybrid vSAN configuration, the SSD resides in which tier? and for the capacity layer for all flash. What is the raw capacity of this cluster as configured? for the witness host to be deemed to have failed? 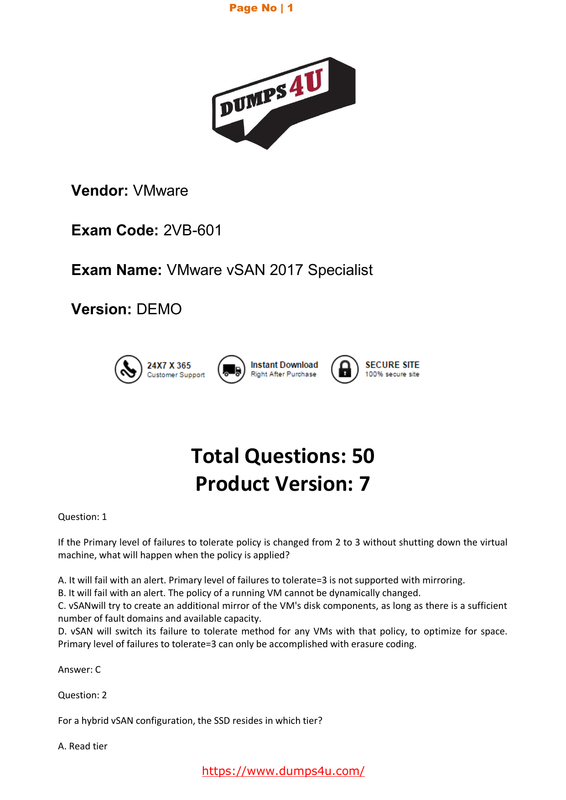 What is the minimum number of physical hosts required to be a supported vSAN configuration? VMware vSAN encryption requires the use of a key management server (KMS) solution. Which Key Management Interoperability Protocol (KMP) must the KMS solution support? coding policy assigned to is?